Stocks remained under pressure last week, as the S&P 500 fell by 3.79 percent to 2,632.56. 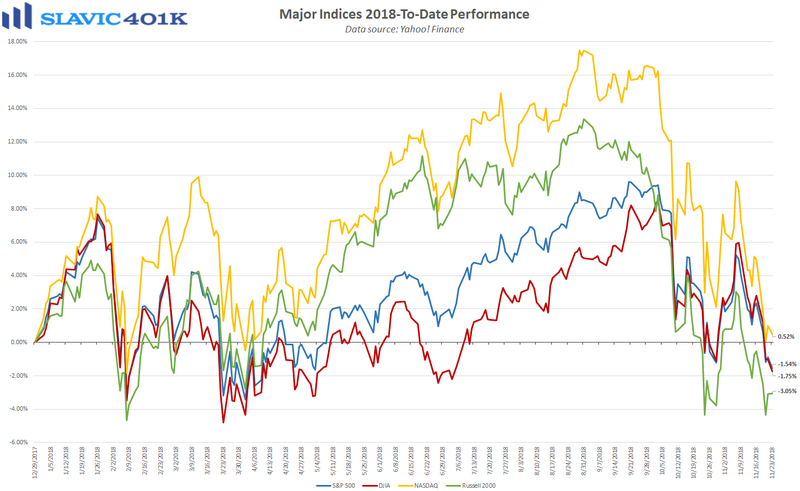 That was the largest decline since October and it left the benchmark index down 1.54 percent year-to-date, and 10.17 percent below the record close hit just two months ago. Trading volumes were relatively low during the past few days due to the Thanksgiving holiday, so many professionals will caution against reading too heavily into the negative price action. 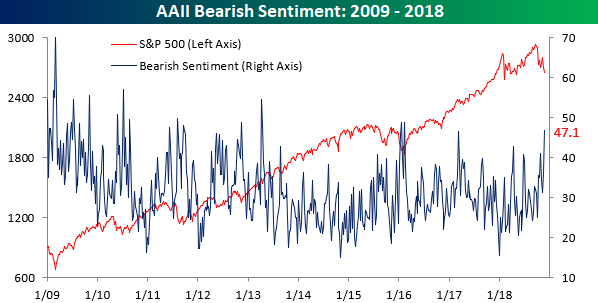 Sentiment, though, has clearly deteriorated recently, as evidenced by the 47.14 percent of investors in the latest AAII survey who said that they believe stock prices on average will be lower six months from now. That is an 11.18 percentage point jump from just one week earlier and the most bearish reading since February 2016. Further, only 25.25 percent of investor respondents said that they expect stock prices to be higher six months from now, well below the long-term average even after major indices have erased all of their year-to-date gains in a very short period of time. 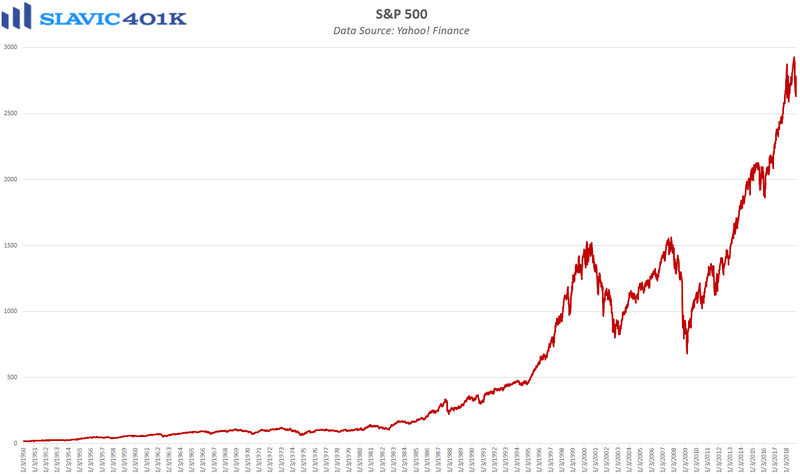 Market Pollyannas and contrarians will point to such statistics and argue that investor pessimism has reached an extreme level, especially since all of the popular explanations in the media for the continued selling are not new. Indeed, concerns about U.S. trade relations, monetary policy, and the sustainability of corporate earnings growth have been around for much of 2018, so positive developments on these fronts may provide an excuse for a bounce in equities. Support for the “oversold” case can also be found in the Dow Jones Industrial Average closing lower every single day last week, only the second time in the past half a century that this has occurred during a Thanksgiving week. 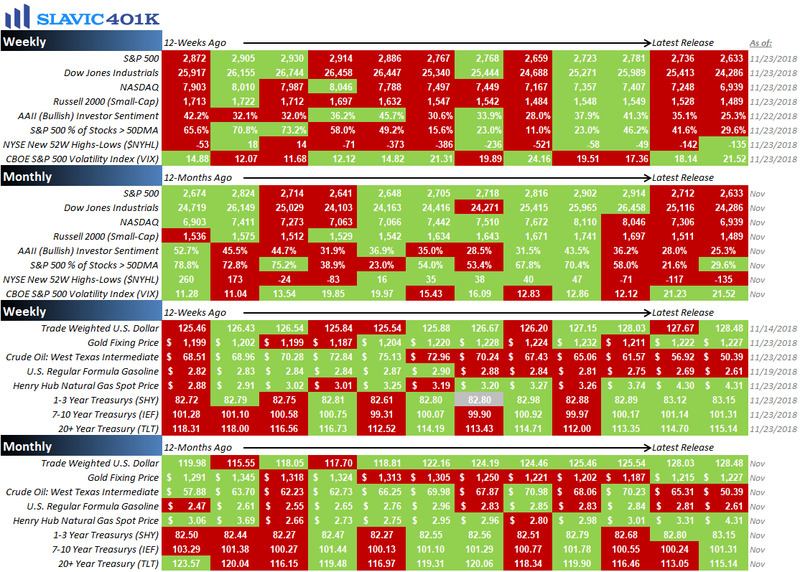 However, there are still plenty of unknowns (risks) to keep volatility elevated in the near-term, and any additional selling pressure could quickly intensify since the stock market is the one market where “customers rush out of the store when things go on sale.” Retail investors uncertain how to navigate this environment should consider consulting with a professional financial advisor and as always, we are here to help with any questions you may have. To recap a few of the things we learned about the economy last (holiday-shortened) week, the positives included that mortgage interest rates retreated, housing starts rebounded, and existing home sales rose for the first time in half a year. 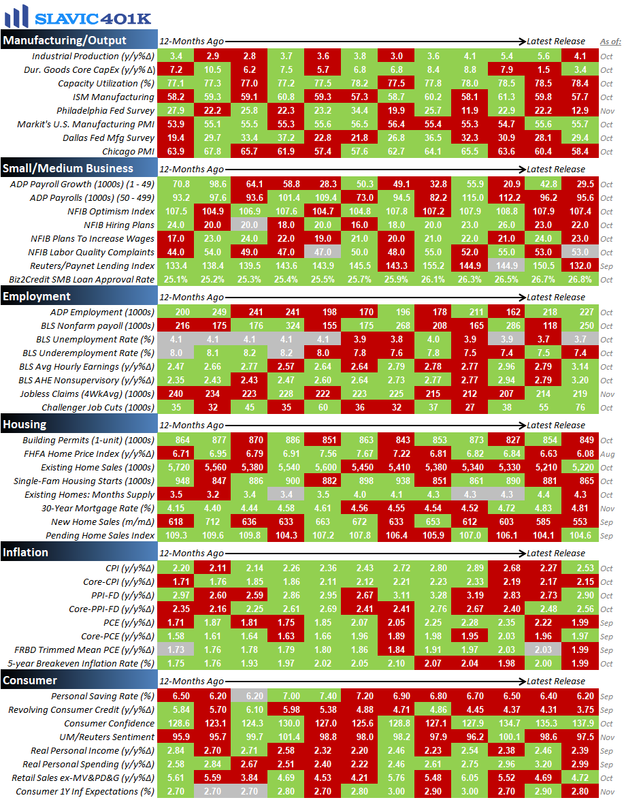 As for the negatives, mortgage applications slid, homebuilder sentiment deteriorated, building permits decreased, consumer confidence cooled, e-commerce retail sales growth slowed, core capital expenditures declined, demand for U.S.-manufactured durable goods fell, and first-time claims for unemployment benefits increased. This week the pace of economic data picks up slightly, with a few important reports on consumers, housing, and inflation scheduled to be released, along with the potentially market-moving minutes from the last Federal Open Market Committee (FOMC) meeting due out on Thursday.